SECONDARY SELLERS, REJOICE! Want one of those fancy flashing banners that doesn't look too elementary for your Teachers Pay Teachers Store? 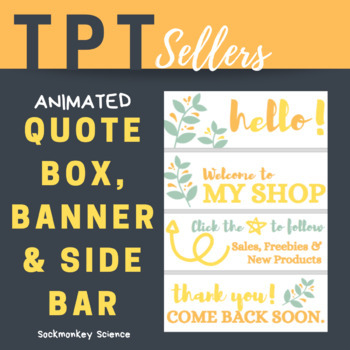 Try this animated Quote Box Banner to draw your shopper's attention. Comes in a bundle with matching Leaderboard Banner and Side Bar Banner, plus step by step instructions for easy installation. Great option for middle school and high school sellers who need something more stylish and contemporary. Theme Colors: Mint, orange and yellow.